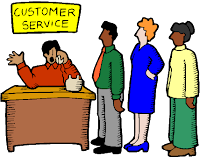 Quite Cloudy by Scott Cameron: What is "Customer Service?" If you asked most businesses, great "Customer Service" would be one of their primary goals. But what is "Customer Service" really? Over the course of my 15 years in Information Technology my definition of customer service has changed and expanded, but really, I learned the basic concept well before I built, sold and repaired my first computers. I learned customer service at Pizza Hut and K-Mart. At Pizza Hut I was taught to take orders. Someone wanted a pizza with mushrooms and pepperoni? I delivered one... and quickly, while it was still hot. I couldn't wait for my first customer to receive their pizza before going on to the next though, so I also learned to multi-task. I needed ALL of my customers to be happy if I wanted to earn my tips. Also, if I provided bad service, people would remember and ask for a different server next time. At K-Mart, I learned to sell. Once upon a time, when Best Buy wasn't around, people bought TVs and VCRs and stereos at K-Mart. I was on commission and quickly learned that the more I sold, the more I made. I became positively eager to help anyone that happened by. I learned to talk to my customers and understand what their needs were so I could help them purchase the right thing. If I sold them too much they would bring it back and be unhappy. If I sold them something too cheap they would be unhappy with the quality. It was my responsibility to ensure they left with the right product and ensure they realized all of the value it had to provide. So, that's Pizza Hut and K-Mart. But what do fast pizza and a discount department store have to offer an IT Professional? Long-term customers are more profitable than short-term customers. Be genuinely interested in their success... yours will follow naturally. Don't give them any reason to go somewhere else. Is that it? Really? Yes. If you can put your customer's success, happiness, and profitability ahead of your own and really help them achieve their goals their company will grow and require more and more of your products and services. Don't go for the quick buck! It just doesn't pay off. When customers know that you enabled their success or helped them make more money or made their lives easier, they will think of you next time and look for you to do the same over and over again. When you take them for a quick buck they WILL realize it sooner or later and they'll never be back. That's part 1. Part 2: Don't mess it up! Once you have a good thing going with a customer, don't give them any reason to look elsewhere. Make sure you have the products and services they want when they want them. Know them well enough so that nobody else can provide the same value that you do. And, don't ever, EVER, take them for granted. It's as easy to lose a customer due to inattention as it is through competition. I built a successful IT consulting business over the course of 7 years using the two rules above. I built long-term customers that came back month after month and year after year. They didn't use my services just because they had before; they came back because we had a relationship that they valued. It wasn't quite personal but it wasn't just business either. I really enjoyed working with them and helping them achieve their goals. Both they and I knew that if they were successful they would require more of my help and I could ride their coat tails all the way to the bank. Our goals were aligned and as long as I did my job and didn't mess it up I had guaranteed happy customers for as long as I wanted them. I wasn't always perfect, and I became complacent and took a couple customers for granted. I lost them. It was, perhaps, the most painful lesson I learned during that 7 years and I learned it VERY quickly. I built processes and procedures to ensure that even when customers were at a maintenance level for a long time I continued to actively add value to their business. I learned to not mess it up. So, it turns out that Pizza Hut and K-Mart really do have something to teach us about customer service in IT after all. How did you learn customer service? What does it mean to you?